Home / Stuff we do / St Bees Head: product test and photoshoot. St Bees Head: product test and photoshoot. A group of local friends and climbers joined us for a quiet afternoon celebrating the beginning of Spring hugging some rocks and testing out some chalk bags. We drove out to the coast, to St Bees; a gorgeous bouldering location. Loaded with pads, shoes, lunch and a bag of new stock we carefully made our way down the cliff side to boulder the afternoon away. Due to the bird ban, and high tide, our visit was restricted to the Apiary wall area – which had lots of problems with a good range of difficulty. We were excited to show off some of the new lightweight panel bags made entirely from offcuts, and the classic horizontal panel recycled rope chalk bags. We also brought along some bracelets and belts for the guys to have a look and test. James and I were joined by Anna, Karly, Tess, Jonathan, Reece, Nick and Lauren. With a good range of climbing abilities it was a chilled day, not about performance or showing off – just everyone confident enough to have a go and to enjoy the day. The day was made possible really by the power of social media , reaching out to those who might be interested in spending the day messing about on some rocks with us proved to be popular, and brought this little group together. 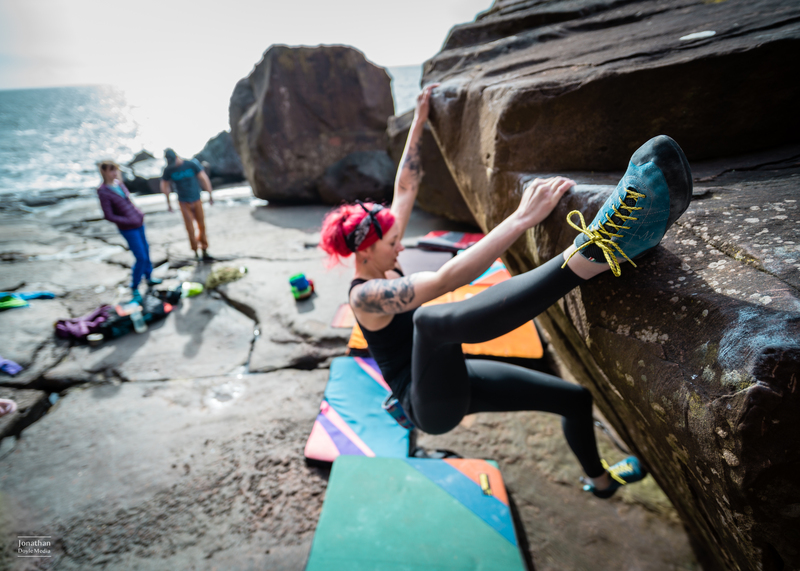 With aching fingers and bellies lit with an enthusiasm for this year’s climbing – we all left with big plans for summer. And us particularly, to make days like this, with new friends all with the love of climbing in common – more regular. Huge thanks to those who came, particularly Jonathan and Reece who worked hard taking photos while we all played. Previous post: Recycled climbing rope rug.